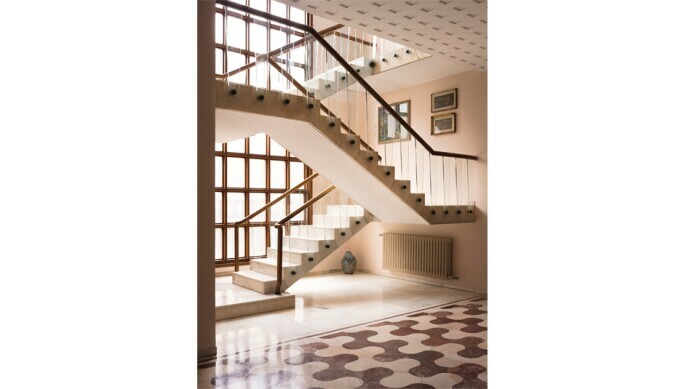 VILLA BORSANI, AN ARRESTING EXAMPLE OF RATIONALIST ARCHITECTURE, IS DESIGNED BY OSVALDO BORSANI AND COMPLETED IN 1945. Open to the public this week during Salone Mobile, a marvelously preserved villa designed by Osvaldo Borsani showcases the innovative – and often collaborative – vision of one of Italy’s most cutting-edge post-war designers. It’s all in the details at Villa Borsani, a meticulously designed masterpiece of design by Osvaldo Borsani. Osvaldo, along with his brother Fulgenzio, was a founder of Tecno, the industrial design company known for employing cutting-edge technology and new materials to create furniture, many of which have become icons of Italian design. 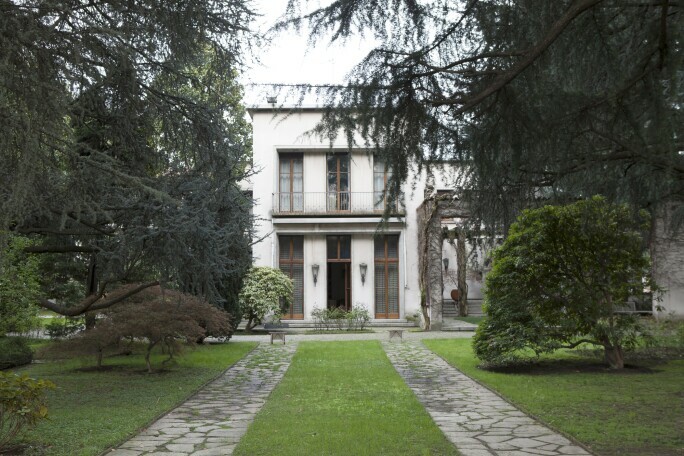 Located just outside of Milan and completed in 1945, the villa was envisioned as a family home for Borsani’s father Gaetano, a highly skilled artisan and cabinetmaker. A unique fusion of rationalist architecture merged with elaborate Art Deco - and Baroque - influenced ornamentation on lush materials – the house captures the two worlds of Borsani. BORSANI DESIGNED EVERY ASPECT OF HIS INTERIORS FROM THE CURTAINS TO THE FURNITURE. LIVING ROOM AT VILLA BORSANI. As a designer, architect, and entrepreneur, Borsani considered and designed every facet in his projects – from ceiling and wall designs to custom-made curtains – and would often include artwork in his sketches. His design ideology also produced notable collaborations with friends, involving some of the most brilliant minds and artists of the time such as luminaries Lucio Fontana, Adriano Spilimbergo, and Arnaldo Pomodoro. 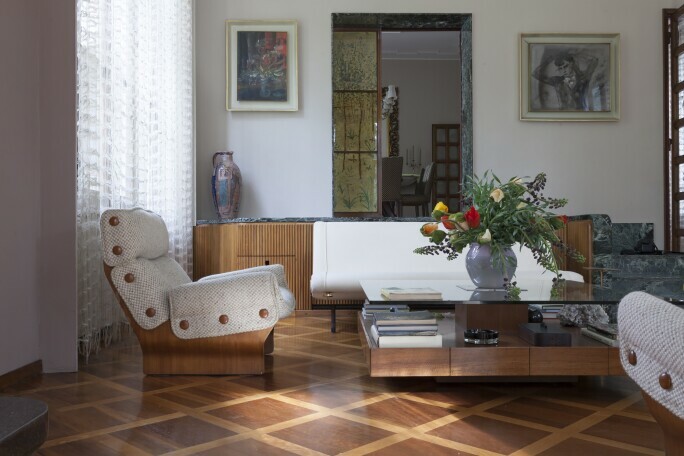 The villa, an archive of original furniture and interior design partnerships between Borsani and his close friends, would also act as a focal meeting point for important and perhaps some entertaining design exchanges amidst his creative crew. 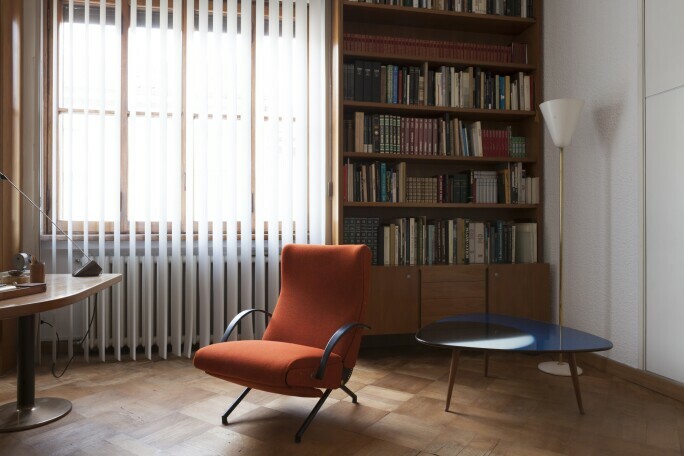 LEFT: OSVALDO BORSANI’S P40 CHAIR. RIGHT: TABLE EMBELLISHMENTS BY LUCIO FONTANA. Tommaso Fantoni, grandson of Borsani and founder of his own architectural studio, imagines a possible humorous correspondence between his grandfather and his friend Gio Ponti, another leading artistic figure and frequent visitor: “Gio Ponti famously designed the armrests facing downwards because he felt it was more resting for the arms, but Osvaldo [Borsani] instead designed his armrests facing upwards because he felt it was better circulation for the arms.” Other noteworthy friends and collaborators include leading Italian post-war artists Lucio Fontana, Roberto Crippa and Fausto Melotti. 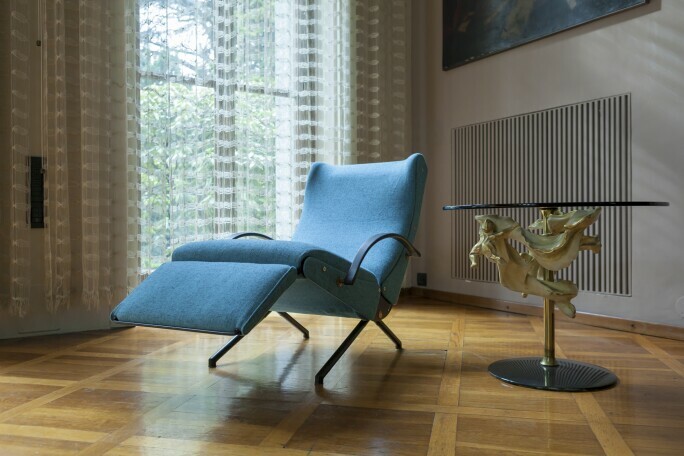 OSVALDO BORSANI’S LOUNGE CHAIR MANUFACTURED BY HIS COMPANY TECNO NEXT TO A COFFEE TABLE COLLABORATION WITH LUCIO FONTANA. Ambra Medda, a close friend of the Borsani family and design consultant for the villa’s opening during Salone Mobile this year, calls attention to its unique design perspective and offerings to observe carefully, from its refined handmade bay windows from Venice to the different levels of the floor to create a sense of intimacy. There were endless details, new materials, and applications that Borsani incorporated within his designs that demonstrated his choice to fuse rationalist ideas with traditional Art Deco and Baroque styles. On his design, Medda notes, “There is a sense of restraint, but coupled with a choice of materials that are more exuberant and lavish.” A wooden sliding door, elegantly embellished by artist Antonio Voltan on one side, separates the dining from living room where one would entertain guests with cocktails and play cards on their Marcello Piccardo-designed table as separate activities. The downstairs bar, decorated in festive harlequin figures by artist Adriano Spilimbergo, displays a common theme of hosting and theatrical influences throughout the house. Paintings of the Madonna and other religious motifs appear throughout as well, even as celestial-like reliefs on the ceilings. Buttons beneath the dining room table communicate to the staff on who is calling for service – a forgotten detail of the past Milanese bourgeois culture. Other impressive and noteworthy elements include the painted mosaic by Spilimbergo above the bathtub and the dramatic opening staircase combining Art Deco details with a modernist direction. A VANITY DESIGNED BY BORSANI. This spring, a series of events will pay homage to the designer and his work. In addition to the opening of the Villa, organized by Fantoni, his mother Valeria (Borsani’s daughter) and Ambra Medda, this May there will be a Borsani retrospective at the Milan Triennale, co-curated by Fantoni and British architect Sir Norman Foster. (One of Borsani’s last projects and notable technological achievements, the “Nomos” table was designed by Foster.) The Archivio Osvaldo Borsani, the family’s archival foundation, and publisher Skira will also be releasing a volume of books focusing on the design pioneer’s expansive and uncompromising career: Osvaldo Borsani: Architect, Designer, Entrepreneur. Ahnna Lee is a New York-based editor and writer, who contributes to vogue.com, among others.